It’s hard to believe it now, but back in the early ‘90s Nintendo was not the dominant force on UK shores. That accolade went to Sega, whose 8-bit Master System and 16-bit Mega Drive were the driving force behind the console revolution in that region of the world. However, with the release of the Game Boy and Super NES, Nintendo started to claw back market share in the United Kingdom, aided by brilliant magazines such as Super Play and TOTAL! (and yes, the upper-case letters and exclamation mark are intentional). 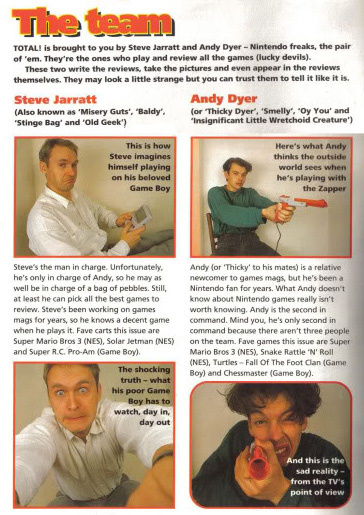 We’ve already spoken to the talented chaps behind the former magazine, so we thought it only fair to catch up with TOTAL!’s Steve Jarratt and Andy Dyer – the guys who launched one of the UK’s best-selling Nintendo-specific publications. Nintendo Life: How did you become involved in video games journalism? Steve Jarratt: I’d been buying ZZAP!64 for about a year, when the position of staff writer on the team came up. I simply applied, hoping I might get to visit the offices to meet the guys on the team. I wasn’t first choice, but the others didn’t work out so some time later – when I’d given up hearing from them – I actually got the job. That proved to be a huge, life-changing event. Andy Dyer: It was pure luck for me, really. I’d always been an avid gamer but never thought for a moment I’d end up working in the industry. Then one day, a house mate who happened to work in publishing told me about a staff writing vacancy on a new launch called Commodore Format. I applied, and miraculously got the job. Nintendo Life: Can you give us a little background in how TOTAL! was conceived? Andy Dyer: I’ve no idea who came up with the idea to launch a Nintendo magazine but as far as the content was involved, Steve was really the driving force and I just sort of gave the thing another voice and, of course, chipped in ideas for individual features and elements. Steve Jarratt: Knowing how Nintendo might have stopped us had it heard about the project, we developed it in secrecy. The first most people heard about it was when it appeared back from the printers. Nintendo Life: When TOTAL! was launched, Sega was very much the dominant force in Europe as far as video games were concerned. Were you ever worried that the magazine might not find a large enough audience to succeed, given Nintendo’s second-place status in this region of the world? Andy Dyer: The NES had long been a presence in the high street, and Game Boy was popular so we knew people were playing Nintendo. It turned out over 100,000 people were waiting for a mag like TOTAL! to arrive. Steve Jarratt: The Game Boy had just launched and was a huge success from day one, and our first issue coincided with Super Mario Bros. 3, which was just fantastic. Certainly on the team we never once questioned the decision. 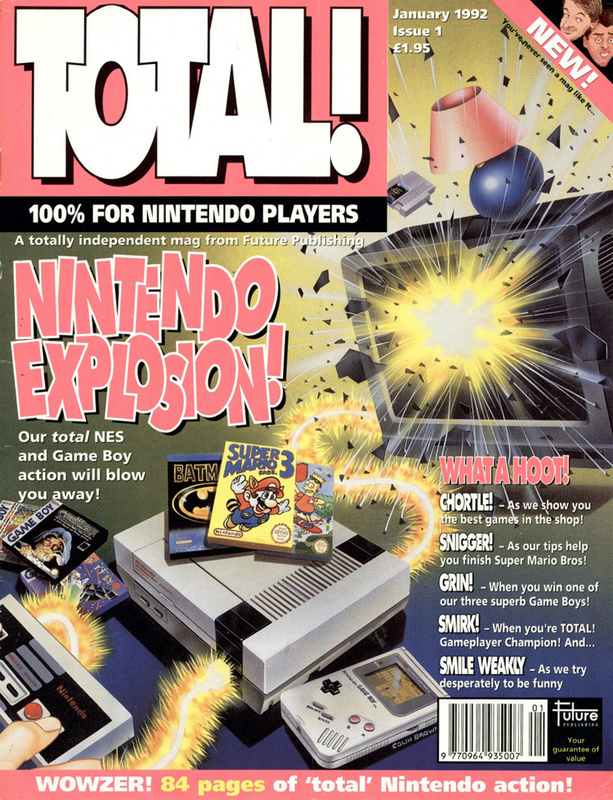 Nintendo Life: TOTAL!’s production values were noticeably superior to rival magazines of the era. From a publishing standpoint, were you doing anything different, or using new technology and processes on the mag? Steve Jarratt: I’m not sure they were that superior. We had a decent-sized art team and spent money on illustrations and so on, but it wasn’t much different from other titles of the day. 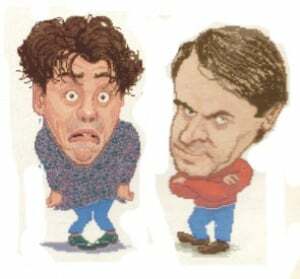 Andy Dyer: Steve – and consequently I – were fastidious about the quality of grabs and images used. I was particularly pleased that by using a system of angle-poise lamps, a cardboard box and a decent camera, I was able to get significantly better Game Boy shots than anyone else. Also, our art editor, Wayne Allen, created partially bespoke templates to suit the content of our reviews which was time consuming, but made things much more interesting than the largely fixed templates you see in mags now. Nintendo Life: TOTAL! was launched just in time to capitalise on the UK release of the Super Nintendo, and this machine would go on to become the focal point of the mag. As gamers, were you excited about the new system at the time? Steve Jarratt: I still remember a guy bringing in a Japanese Super Famicom for the first time and playing games like Pilotwings and F-Zero with the Mode 7 graphics, which totally blew me away. I adored the SNES. I spent a fortune on an import system and Japanese games. Andy Dyer: I was a home computer and Game Boy fan at the time so largely unaware of the upcoming console before joining TOTAL!, but yes, the moment I saw Pilotwings running in Mode 7 on an imported Super Famicom, I couldn’t believe my eyes, or my luck. @2: I read it till the end. The ones we we have now (N-Zone / Wii-Magazine) can't compete with this at all! I was a big TOTAL! fan. I had an almost complete run of issues and was actually a subscriber when it ended. Unfortunately most of them got chucked out at some point although I still have some around including the first issue (with the adventure game down the sides of the pages) and the final one. A fun mag to begin with that matured a little as it went on. I don't think that's a bad thing, I quite liked that in the last few issues the vibe was "hey the N64 is going to be great, mind you that PlayStation looks good..."
Glad to see this feature appear as it was a popular mag that is usually ignored. The adventures of Baldy and Thicky. These guys got me into videogame magazines. Actually, my first issue was #12 or #13; the one with the Mickey's Magical Quest on the cover. And I would never have guessed that was Frank. I had been wondering what he'd been up to. Total! remained one of my favourite magazines as a kid. But it really went downhill in its last few issues. i loved total as a kid, they gave away a free xmen comic for the release of arcadias revenge on the snes. i wish that i kept that issue, but i did manage to keep the free comic though. Thanks for this. I was a huge fan of TOTAL! back in the day. Looks like an awesome magazine. I love the old NES and SNES NIntendo Powers. There were some great videogame magazines in the UK back in the day; TOTAL! (although I never really read it to be honest), Super Play, C&VG, EDGE, Maximum...but the original Mean Machines was the Big Boss imo. @Kirk And what a fine website that is too! Great interview! I was such a fan of this mag when I was a kid. It was never the same after Steve and Andy left. Thanks for the chuckles guys! TOTAL! was a great mag. There was definitely a friendly rivalry between us (SPlay) and them In fact, I've still got TOTAL's 24 meg Super Wildcard. Er, sorry about that guys. You're not having it back now. Yeah takes me back too, I had every single issue for at least the first 2 years of it's publication. Ah, a random Wil Overton appearance! That was unexpected. Good luck to Steve Jarratt on whatever he does next! Guys help me please, what was the last 'making of' magazine feature on / in Nintendo life? Oh yeah, the good ol' times when you still needed a mag to be informed on games. More expensive, but kind of nice too. And it seems i only really cared about the reviews since i can't remember anything else from a Nintendo mag. But TOTAL! does ring a bell. If i had a non-Nintendo console too i think i'd always get EDGE magazine. And that other mag which is nearly the same whose name i can't remember now . @Pj1: Could it be this one about the Super Play magazine ? That's it thank you LTD. The German TOTAL! was also great in my opinion, it was printed on different kind of paper. I wasn't quite good with the German language, yet, i thoroughly enjoyed 'reading' quite a lot of the German issues of TOTAL! The first one i bought in Germany actually, the one with The Lost Vikings on the cover. Good times. Many thanks and good luck to Steve and Andy, whatever they do!